The SpeakEasy™ v3b is a self-contained, battery-powered speaker with mic, line and instrument level inputs for production sound use. 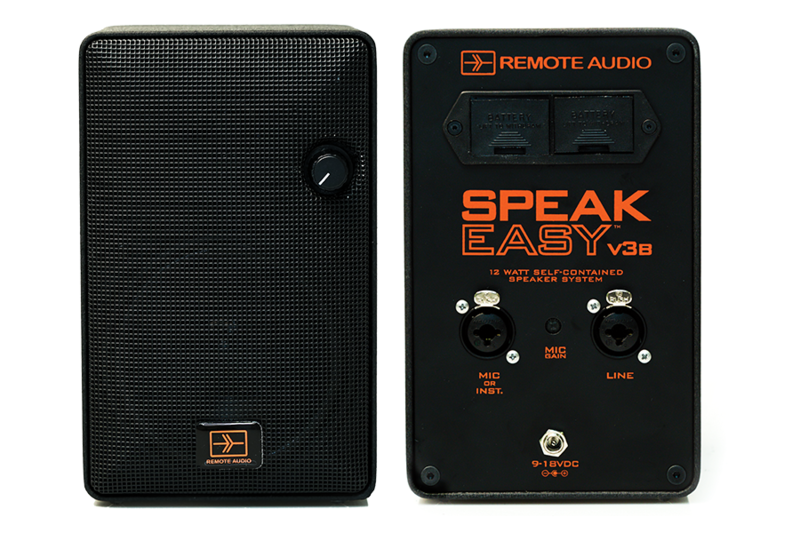 The SpeakEasy™ v3b is housed in a cast aluminum enclosure with a durable black finish. At under 5 pounds, the unit is small enough to hide on set and rugged enough to pack in a case with the rest of your gear. The back of the unit has two combo jacks for connecting mic, line or instrument level inputs. The mic trim provides up to 40dB of amplification. The inputs are isolated from one another so they can be used at the same time. 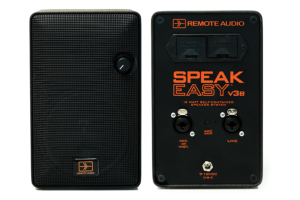 With a single pair of 9-volt batteries, the SpeakEasy™ v3b will operate for a full production day or more. The unit also has a coaxial DC jack for external powering. Its 12-watt amplifier delivers more than enough volume for monitoring or cueing. Use on your cart to listen without headphones. Place it anywhere on set with a wireless receiver for cueing and stage announce. Plant it in a car during tow scenes so the director can talk to actors (when used with the Boom Box). Connect one (or two) to your computer or iPod for remote listening and editing. Monitor programming during remote radio and television broadcasts. Plant it inside a piano for realistic track playback. DC Input Connector: 5.5mm x 2.1mm coaxial. Center pin positive. * 48V phantom power for condenser microphones is not provided. 12 Volt, 1.5 Amp wall-wart power supply for the SpeakEasy™. Dynamic microphone with momentary push button switch for on set cueing. 3.5mm input cable for the Speakeasy. Stereo output summed to mono. Great for playback from a computer or portable music player. 18 inches. If you are not using the microphone input, turn the mic gain trim at the rear of the unit to the fully counter-clockwise position. The microphone signal is always present at the output of the SpeakEasy™ even when this input is disconnected. If the noise persists, make sure proper signal levels are being sent to the SpeakEasy™. With a +4dBu line level input, maximum volume should be achieved with the front volume knob set around the 12 o’clock position. If you are powering the SpeakEasy™ with batteries, try a new set. Depleted batteries may cause the unit to emit a crackling sound. If you are using an external power supply, try running the unit on batteries. If the noise goes away, you may have a bad power supply or a ground loop in your system.